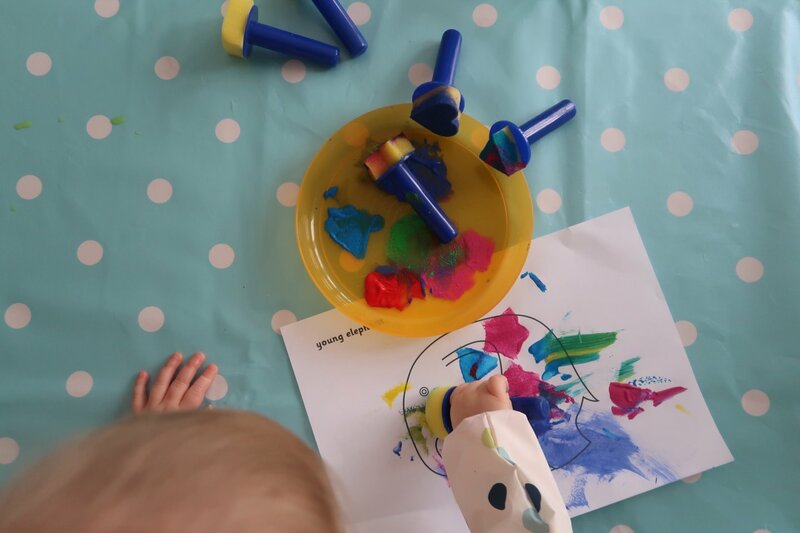 *, and a super simple painting activity to go with it. 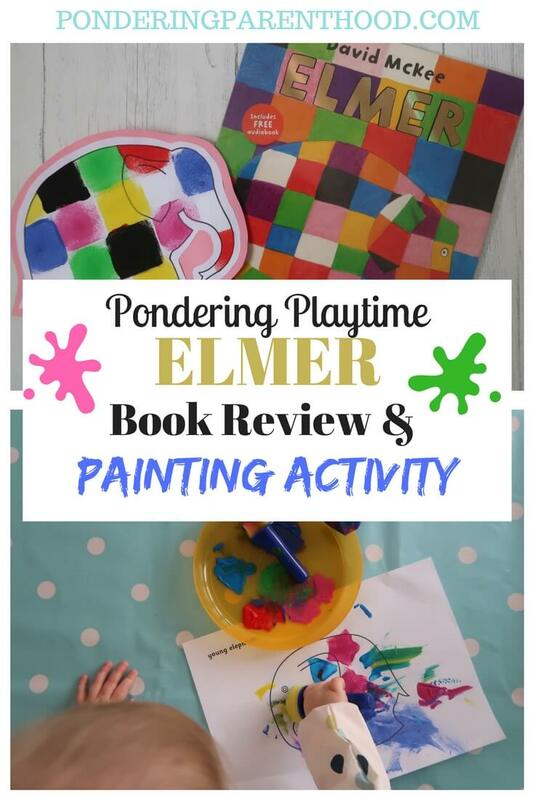 Elmer – What’s the Story? 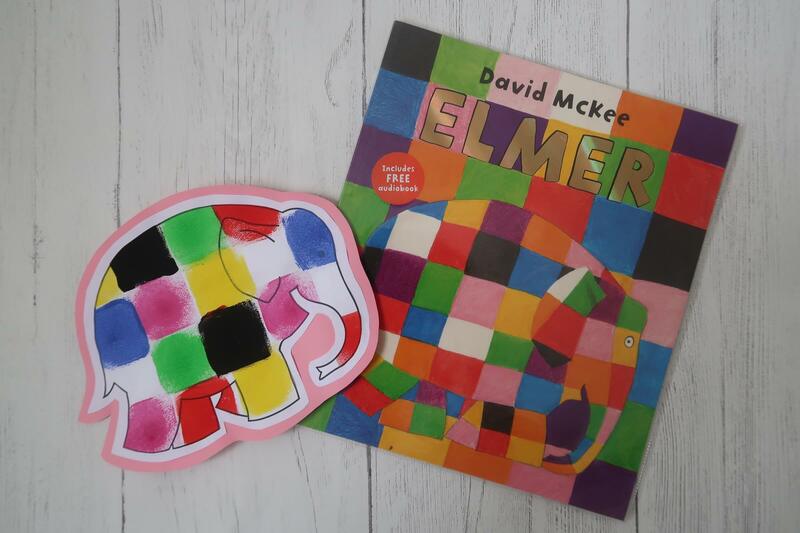 Elmer is about a colourful elephant of the same name, who doesn’t look quite like the rest of the elephants in the herd. 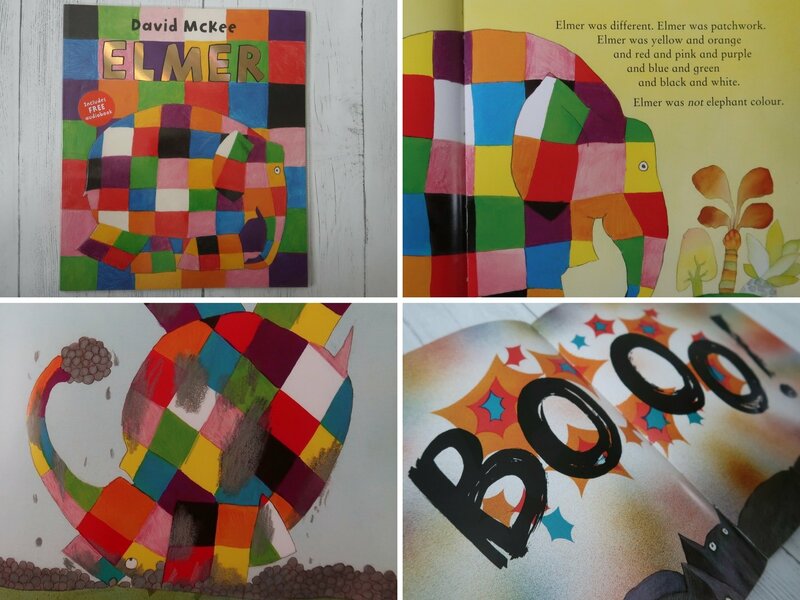 A story about trying to fit in but ultimately being yourself, Elmer shares a lovely message through gorgeous, colourful illustrations. This activity is super simple. 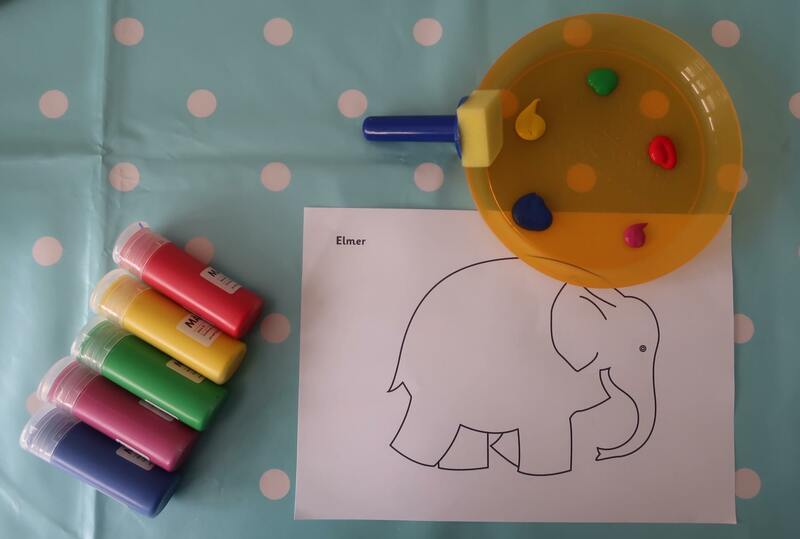 All you need is some paints, sponges and these free Elmer elephant printables. There are a lot of ads on the site that I found them on, but if you look carefully for the small link to click to download, you’ll be able to avoid them! I’ll be honest. I did the example in the first picture of this post! At 22 months M doesn’t have the control to sponge paint lovely neat squares like that. But I’m sure it’s something that older children could aim to achieve. Instead, I gave M a selection of different coloured paints and different shaped sponges and she went to town. In fact, she enjoyed it so much, we’ve done this activity twice as I printed out quite a few different elephants for her. Elmer is a book that we frequently get out of the library. M loves to revisit it and always squeaks away and points to Elmer. 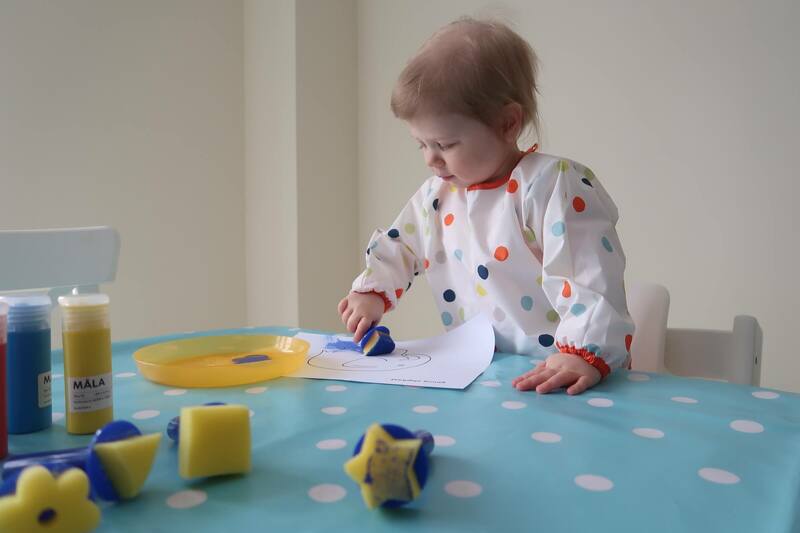 It’s also helping her to learn her colours, as we point to the different colours on Elmer as we’re reading. Her favourite is definitely pur-ple! As for the painting, M loves it! She now gets excited as soon as she sees me getting out the dotty tablecloth as she knows we’re going to do something fun. M knew exactly which colours she wanted to use for this activity and asked to use almost all of the colours at some point. She’s shown such progress and confidence since the first time we got the paints out. "Ponderings on Two – Advice from Scrapbook Blog"